Robert E. Brackett, Ph.D. has been named by President John Anderson as the new director and vice president of the National Center for Food Safety and Technology at Illinois Institute of Technology. Brackett will be responsible for managing the center and will report directly to IIT’s Provost, Dr. Alan W. Cramb. Brackett most recently served as senior vice president and chief science and regulatory officer for the Grocery Manufacturers Association (GMA), a position he has held since 2007. Brackett has nearly 30 years of experience in scientific research in industry, government and academia. 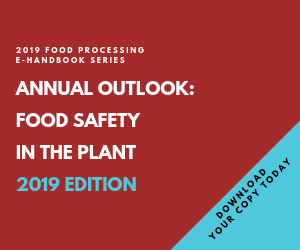 Prior to his position at GMA, he worked at the U.S. Food and Drug Administration’s Center for Food Safety and Applied Nutrition where he started as a senior microbiologist in the Office of Plant and Dairy Foods and Beverages in 2000. Earlier in his career, Brackett held professorial positions with North Carolina State University in Raleigh, and the University of Georgia in both its Department of Food Science and Technology and the Center for Food Safety and Quality Enhancement.